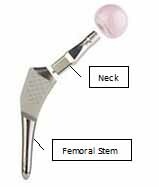 ABGII Modular Femoral Stem and Modular Neck – hip replacement system. The Therapeutic Goods Administration (TGA) advises that Stryker Australia Pty Ltd is recalling the ABGII Modular Femoral Stem and Modular Neck system used in hip replacements. This recall is occurring worldwide because of the potential for fretting and corrosion at the join between the femoral stem and the neck component of the ABGII Modular System. Fretting and corrosion can result in metal debris in and around the hip joint. If this occurs, patients may experience inflammation, adverse local tissue reactions (ALTRs), hypersensitivity/allergic reactions and osteolysis (bone loss). The worldwide rate of complaints received by the manufacturer related to ALTR as well as unexplained pain, in relation to the total number of implanted components is less than 0.5%. The TGA has been advised that 258 ABGII Modular Femoral Stem and Modular Neck systems have been implanted in Australia since 2007. None have been implanted since February 2012. Stryker Australia Pty Ltd has contacted every Australian orthopaedic surgeon who has ever implanted the ABGII modular hip replacement system. Those surgeons have been asked to contact their patients to discuss what clinical action is most appropriate. The ABGII Modular Femoral Stem and Modular Neck has been cancelled from the Australian Register of Therapeutic Goods (ARTG). ABGII femoral implants with fixed (non-modular) necks are not being recalled. The stem is inserted into the patient’s femur and the neck is then inserted firmly into the femoral stem. The neck is supplied in a variety of lengths and angles, allowing the surgeon to adjust the hip prosthesis during the operation. If you are experiencing hip or thigh pain, or are concerned about your hip replacement, please contact your implanting surgeon to arrange a review appointment. If you are NOT experiencing hip or thigh pain and are not concerned about your hip replacement then it is not necessary for you to do anything. Just follow the normal follow up schedule agreed between you and your surgeon. Surgeons should ensure that their patients who have been implanted with an ABG II modular hip replacement system are followed-up regularly and undergo clinical evaluation as per their usual protocol. If a patient is experiencing pain and/or swelling involving the groin, buttock, lateral hip or thigh, the surgeon should rule out aseptic loosening or periprosthetic sepsis, common conditions following joint replacement surgery that are not related to an ALTR to metal wear debris. Once the surgeon has ruled out aseptic loosening and periprosthetic sepsis, the surgeon should evaluate the patient for an ALTR potentially related to metal wear debris. Testing includes blood work for metal ion levels chromium and cobalt levels over 7 ppb are commonly considered high) and either an MRI or ultrasound to look for soft tissue mass or fluid collection. If the results reveal an ALTR to metal wear debris, the surgeon should consider proceeding with a revision of the femoral component to a monolithic stem. Consumers and health professionals are encouraged to report problems with medical devices. Please refer to the TGA Internet site for more information on the TGA Incident Reporting and Investigation Scheme (IRIS). You are strongly encouraged to talk with a health professional if you are concerned about a possible adverse event associated with a medical device.